You can configure the mosquitto broker using a configuration file. The default configuration file is called mosquitto.conf and it is used by the mosquitto broker when started as a Linux daemon or Windows service. You will find the mosquitto.conf file in the /etc/mosquito directory on Linux, and in the c:\mosquitto\ directory on Windows. Note: the Windows install lets you choose the directory. Important: In order for changes in the mosquitto.conf file to become effective you must restart the mosquitto broker. The default mosquitto.conf file has all of the settings commented out and the broker doesn’t require a configuration file to run. If you look at the settings you will find that they are divided into sections and some of the settings affect the entire broker instance, whereas others affect a particular listener. Important- An extra listener is effectively an additional port, and not an additional broker! The diagram below is my understanding of how the settings apply. The mosquitto broker can be configured to listen on several ports at the same time. However this configuration doesn’t mean that you have virtual brokers. as most of the configuration is shared. You cannot, for example, configure a broker to listen on port 1884, and to allow anonymous access, and also to listen on port 1885 and not allow anonymous access. Because they are part of the same broker instance they share the allow_anonymous setting. 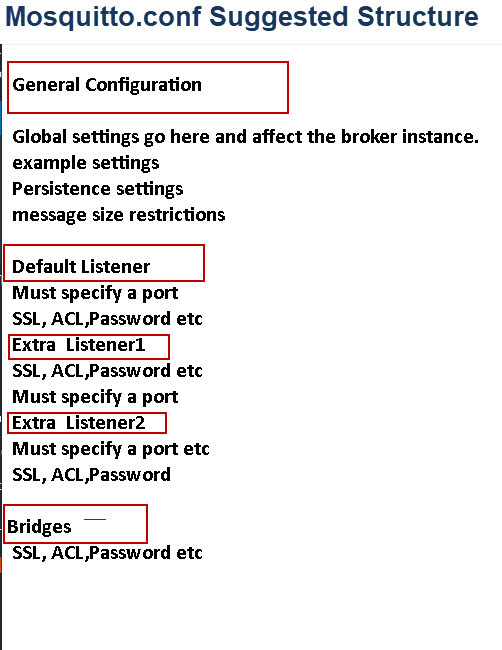 However you can configure a broker to listen on a port and require SSL and also to listen on another port and not use SSL. and other similar commands start mosquitto without using a configuration file. If you install mosquitto as a service on Windows then it starts using the mosquitto.conf. The Linux install also configures the Mosquitto broker to start automatically using the mosquitto.conf file.. Important: When testing mosquitto you need to stop the mosquitto instance that has been started when the machine booted, and then start your own instance from the command line. You can use a normal text editor to edit the file. Although it is tempting to edit the particular section of the file it can be very difficult finding what settings you have changed. Therefore put all of your settings at the top of the file, and use the commented out section as documentation. If you do edit the individual sections then I have created a simple Python script that will display only the un-commented settings from the file. If you update mosquitto configuration files you can restart mosquitto to pick up the changes. You can configure a broker to listen on several ports, but to create multiple brokers with their own configurations then you will need to start multiple instances of mosquitto. I got some data missing when connected IoT devices to the mosquitto I installed on Linux. But if I connect the devices to “m2m.eclipse.org” or “test.mosquitto.org”, no data was missing. Do you have any idea what’s going on here? All the setting for mosquitto are default on my Linux. I would suspect a local nwtwork issue. Did you start mosquitto in verbose mode so that you could be the messages. Hi, i configuring MQTT in windows server. How do i change my port number in windows and make MQTT available to public address? sc start “mosquitto” followed by sc query “mosquitto”. The sc queries show the STATE as 2 START_PENDING and followed by STATE as 1 STOPPED. Any reason why mosquitto broker couldn’t be started? I would suspect an error in the config file or it can’t find it.Have you tried staring from the command line as mosquitto -c configfile as it may give you more info. Where is it default config file? The default mosquitto.conf file is in the /etc/mosquitto folder. However mosquitto doesn’t need a conf file to start. When you start mosquitto using mosquitto -v it isn’t using a conf file. Check your conf file for typos as that also results in not found errors. How to make mosquitto broker running on PC to listen to 1883 and also 9001, because i have a mosqutto cpp client which publishes on one topic which needs to listen by mqtt web app. 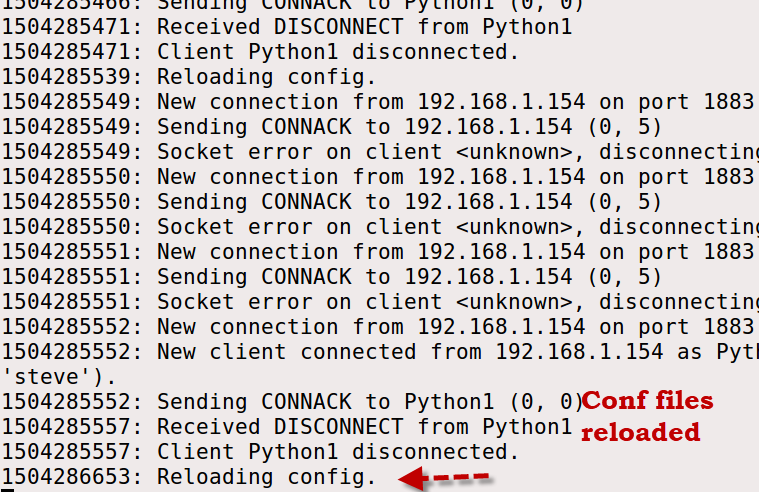 when i set mosquitto.conf to 9001, the mosqitto cpp client is not connecting to local broker, but webapp is getting connected to broker running on my PC. How to edit this config file through code and restart this broker? By edit by code do you mean using a web type interface to create the file? What is the difference between kill -SIGHUP and kill -HUP? Mosquitto official documents use kill -SIGHUP.